The windows of Turkish houses in Kirklareli Province have undergone both a cultural and structural change due to the rapid urbanization experienced in the last 60 years. Throughout history, many different cultures have flourished together in this region, which has resulted in the construction of a variety of styles of buildings. Today, both these buildings and unique architectural features such as their windows are on the brink of total destruction. Only a small number of traditional buildings have been subjected to architectural surveys and many such buildings have already been totally destroyed or are at risk of destruction. The purposes of this eBook can be listed as follows: firstly, to provide a comprehensive and detailed record of the window examples which constitute an important architectural element of the multicultural city of Kirklareli, and which also bear the traces of the history of the East Balkans; secondly, to present information on the designs and structures built by the practitioners in parallel with the historical developments and changes in the window element. Such information will help academics and practitioners in making deductions about future window trends, aesthetic values and structural characteristics. The third purpose of the eBook is to raise awareness of such buildings among users and other stakeholder, concerning architectural details of the traditional city pattern, which is an important factor in the successful realization of urban conservation projects. Windows are an important feature in terms of the history of buildings: they reflect not only the changing architectural tastes and styles, but also social hierarchy, building economy, arts and crafts skills and technical developments. In addition, while influencing the characteristics of buildings as a single element, windows also influence the character of the whole region. The main purpose of this study is to discuss the windows of traditional buildings constructed in the Kirklareli Province of Turkey during the late 19th and early 20th centuries, within a context explaining the structural and stylistic characteristics of the windows; and, to present the findings via rich and detailed visual content. 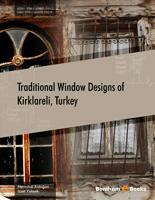 This eBook defines the term “window”; presents a literature review of studies of characteristics of late 19th and early 20th century windows of the anonymous architecture around the world and in Turkey; and classifies structural, stylistic and functional characteristics of windows representative of traditional Kirklareli architecture. To this end, these characteristics were used as the basis for the analysis of 103 traditional types of window design. As stated above, the eBook aims to serve as an important reference for future urban conservation and design-planning works. This eBook was produced with the valuable contributions of many people. In particular, the window drawings were produced by drafts-men under the supervision of Mr. Izzet YUKSEK. We would like to thank, firstly, the people of Kirklareli, for allowing and assisting in the analysis of historical window styles; and the publication team of Bentham Science Publishers.